The process of applying for Social Security Disability Benefits is complicated and frustrating. Let me do it for you. I offer free consultations and any attorneys fees are taken from past due benefits, so you pay me no out-of-pocket costs, win or lose. Occasionally individuals apply for Social Security benefits themselves, without the help of an attorney. I cannot stress enough what a bad Idea I think this is. Do you perform your own surgery? File your own lawsuit? No. Then why should you represent yourself through this complicated process without the help of an knowledgeable attorney, at no out-of-pocket cost to you? That's right, I collect nothing if I cannot get you disability benefits, and if we are successful in getting you benefits, I only collect 25% of the back-due amount owed to you. Obviously you do not want to go in front of a Judge unrepresented, but even at the "initial" level I will work with the claims examiner, and obtain and submit relevant documents that can improve the likelihood of a quick, favorable outcome at the Initial level (and avoid the 6-12 month delay it typically takes for a hearing before a Judge), all at no out-of-pocket cost to you. The disability process can be confusing, however a better understanding of the system will help you understand what is going on with your claim, what delays to expect and help me better represent you. There are two types of “Social Security Disability Benefits,” SSI (Supplemental Security Income) and SSDI (Social Security Disability Insurance). SSDI has a few advantages (including possible benefits for the claimant children or spouse), but you have to have worked and paid enough Social Security taxes (for “credits”) to be entitled to it. If you do not have enough “credits,” you will be rejected for SSDI only a few weeks after your application, but that is ok, everyone is eligible for SSI benefits, if they are found disabled. SSI does not have some of the same advantages as SSDI, but everyone is eligible, regardless of how much you have paid in Social Security taxes. In many states, you become entitled to Medicaid benefits when approved for SSI benefits. After you get your original paperwork to me, we will file your application. After we file it, we will set up a telephone call with Social Security. You and I will work with a “claims examiner” from Disability Determination Services (Social Security), who orders your medical records. It is important to let the examiner and I know of all the places you treated to maximize your claim. After Social Security examines your application and medical records, they will let you know whether your claim is successful or has been denied. If your claim was denied, some states (Mississippi, Florida) allow you to file a “Request for Reconsideration,” in which you follow the same initial process, but different examiner reviews your application. If the Request for Reconsideration is denied, you may then appeal further by requesting a hearing before an Administrative Law Judge. In other states (Louisiana, Alabama), if you are denied at the "initial" level you can move straight to filing a Request a Hearing Before an Administrative Law Judge. 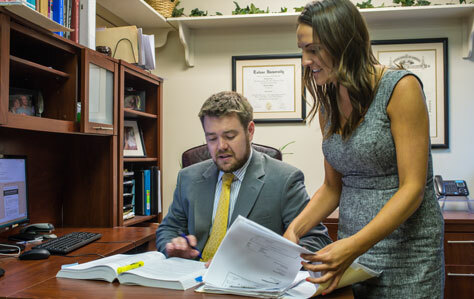 Whichever method is necessary, my office will help you file properly and appeal the denial of your claim. If you are denied at the 'initial' stage, we will Request a Hearing Before an Administrative Law Judge. At this point I review all the records that were obtained at the “Initial” stage and obtain any new records or records that were not collected at the “Initial” stage. Eventually, you will be given a hearing date and I will prepare you, submit all the records and usually a “position paper” to the Judge, and we will go to your hearing before an Administrative Law Judge. This is, however, a long process. In most regions it takes six months to a year, and sometimes longer, before you have a hearing. After your hearing the Judge will render a written decision, however sometimes even this takes several months. If the Judge denies your claim, you can appeal his or her decision to the Appeals Council. Occasionally the council overturns the Judge’s decision, however, it is not common and sometimes takes up to two to three years. Given the delays and low reversal rate, appeals should be filed only in limited cases. In many cases it is just better to initiate a new claim. These are the two short forms I need you to fill out and return to me so that I may represent you. Only fill out the highlighted portions. This document allows me to obtain your medical records. Only fill out the highlighted portions. This document allows Social Security to obtain your medical records at the “Initial” stage. This is a form Social Security wants at the initial stage that tells them about you and your claim. While it can be long and tedious, it is important to fill it out as thoroughly and accurately as possible, which will make your claim go quicker and improve your chance for success. This is another document that tells Social security about yourself and you claim; this one is needed anytime you Request a Hearing or Reconsideration in order to update Social Security about your conditions. This form allows you to give Social Security and myself a list of the places and doctors you have treated with and when. A list of places you have worked and when you worked there. A list of your prescriptions, including dosages, times taken and who prescribed them for you. This is the form you need to fill out and return to me in order to file an SSDI claim, if you have enough ?work credits.? Alternately, once you sign up with me you can just fill it out online at https://secure.ssa.gov/iCLM/dib.